The Tongan Islands of Vava'u with their safe anchorages and secluded coves offer one of the world's finest cruising areas. 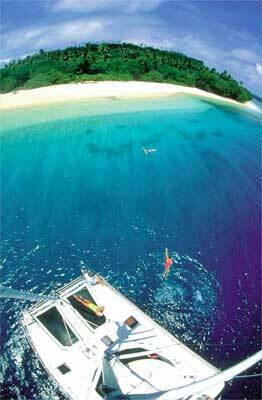 The Northernmost group of the Tongan Islands, the Vava'u Archipelago is blessed with a near-perfect climate for year-round sailing. It is estimated to have had over 2,000 years of settlement. This group of islands is a place of brilliant colours, blue lagoons, fine white coral sand beaches and lush green coconut plantations. Experienced travellers liken the Vava'u group to "a cross between the Bahamas and the Virgin Islands" with its dramatic deep water dropoffs and brilliant shallow lagoons. The Vava'u group has a population of about 20,000 spread over most of the 50-odd islands - about a third live in or around Neiafu and the harbour, where there are four nearby villages: Makave, Taoa, Toula and Vaimalo. South Pacific Sailing's base is in the heart of Neiafu. Neiafu is a natural harbour and is one of the most picturesque in the pacific. It is a deep and wholly sheltered, fiord-like anchorage. From this central location there are in excess of forty recognised anchorages in an area no more than 30 miles long and 20 miles wide. The diving and snorkelling is amazing in crystal clear water with its brilliantly coloured coral and reef fish. During the period from July to November the area is home to huge pods of Humpback whales which often swim with the yachts accompanied by their newly-born offspring. For those who enjoy dining out, Tongan beach feasts are regular functions at the local resorts. There are also a number of island beach bars and restaurants set in magical anchorages, ideal for watching the famous Tongan sunsets. Street Address: 127 Beaumont St., Freemans Bay, Auckland, 1010. Postal Address: PO Box 33-729 Takapuna, Auckland, 0740, New Zealand.